The 2018 Toyota Pruis c is the most affordable hybrid, and this year brings a new, more hip design, standard black roof rail and colorful rear spoiler. We like it, and much more than its predecessor. We were surprised at the somewhat noisy hybrid engine and transmission, but the 48/43/46 mpg. is pleasing. This versatile little compact car is equipped with Toyota’s Entune audio system, and if you opt for the trim level offering the most goodies (Four), you’ll be able to play all genres of music. The standard Entune Audio system includes the Entune Multimedia Bundle, a 6.1-inch touch screen display, six speakers for the AM/FM/CD player (with MP3/WMA playback capability). And for those who are always connected, an auxiliary audio jack, USB 2.0-port with iPod connectivity and control, advanced voice recognition and Bluetooth are standard. Phonebook access and music streaming are also available. If you’re an Apple user, you use Siri Eyes Free for requests. We thought the speakers left a little to be desired, and the control knobs not easily operated. It may seem odd today to say for $26,000, you get a lot of car. But when the average price of an automobile today is $36,495, it is reasonable to get something under $30,000. Our Prius c came equipped with just two options, including Body Side Moldings ($209), and Carpet Floor Mats/Cargo Mat ($224). The Prius c is available in four models: One: $20,630; Two: $21,430; Three: $22,855 and Four: $24,965. The test car came in “eye-popping” Absolutely Red color that stood out and seemed to fit this small crossover design. The sporty details make it more appealing to all, and the seating for five, although a tad cramped, allows for passengers and gear. 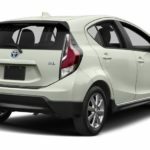 Toyota Prius c adds two new colors to the color palette for 2018: Sandstorm and, new for Toyota, Tide Pool Pearl.All new colors make the car easier to spot on the back roads at night. Also updated for 2018 are the black side rocker and wheel arch moldings which seem to frame the 15-inc, 8-spoke wheels well. We’re beginning to prefer these darker wheels; gray in the c’s case, but often seen in black these days, on other manufacturer’s models. 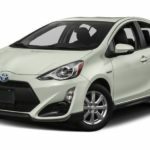 In addition to the usual Toyota warranty (see SPECS), the Toyota Prius c comes standard with ToyotaCare, a complimentary plan covering normal factory-scheduled maintenance and 24-hour roadside assistance for two years or 25,000 miles, whichever comes first. Of course, the Prius c has a standard integrated backup camera for 2018. Along with the latest in safety technology, this is a safe car despite its small stature. Standard safety features include Toyota Safety Sense C (TSS-C) driver-assist technologies, Pre-Collision System (PCS), Lane Departure Alert (LDA), and Automatic High Beams. TSS-C is designed to take care of key areas of driver assistance, including preventing or mitigating front collisions, helping to enhance nightime driving/road safety and to help drivers stay in their lane. As expected, Toyota is ahead of other manufacturers in safety items, including automatic emergency braking systems. In case you were wondering what the “c” in the Prius c stands for, we’ll tune you in. The ‘c’ stands for ‘city.’ The ‘c’ philosophy means that although the car itself may ‘seem’ small, it’s not small inside. The cabin is bigger than expected (often the case these days with small vehicles), as the design maximizes interior space well. The rear-seat provides 35-inches of space for stretching out, and the cargo volume measures 17.1-cu.ft. Of course, to add space the rear seats are a 60/40-split. Because of its size, the Prius c is easy to drive and maneuver. Great to park, and easy to drive around town due to its agility. The hybrid battery is located beneath the rear seats, and the gas tank is easily accessible on the rear of the driver’s side. Adding a slight ‘luxury’ feel, the Prius c Four adds LED fog lights, a power tilt/slide moonroof (which we inadvertently began to open in rain! ), sliding sunshade, heated front seats and outside mirrors, and SofTex-trimmed seats. The interior seats were a light cream, which went nicely with the Absolutely Red exterior. As hybrid systems go, they are relatively trouble-free and provide years of service. In the case of the Prius c, its hybrid system works with a gasoline engine, incorporating a electric motor within a continuously variable transaxle, a nickel-metal hydride battery, a power control unit (inverter), a DC-DC converter, and a step-up converter. A hybrid control computer manages the application of gasoline engine and electric power, which depends on the drive mode and driving demands. As with many vehicles today, the driver has a choice of driving modes, that generally include ECO, Normal and Sport modes. Depending on terrain and circumstances, the ECO is a favorite and provides good mileage. We would guess most drivers change modes less often than imagined. EV mode allows for driving just by electric power for up to one mile. Most often used when driving around town. Occupant safety in the 2018 Prius c is Toyota’s number one concern. Anyone driving this vehicle can be assured of that, with nine airbags, standard Star Safety System (Vehicle Stability Control, Traction Control, ABS, Electronic Force Distribution, Smart Stop Technology). As mentioned above, Toyota is ahead of most with its Safety Sense-C (TSS-C), featuring Automatic Emergency Braking. Toyota’s Pre-collision System (PCS) operates at vehicle speeds of about 7 to 85 mph, uses a camera and laser beam to detect the vehicle ahead. PCS may provide additional braking force using Brake Assist, if needed. Speed is reduced so that if a collision occurs, damage is a lot less. Lane Departure Alert (which we find annoying) also uses a camera to detect visible lane markings and reminds drivers to get back in their lane. Also helpful, especially on back roads is the Automatic High Beam system which detects the headlights of oncoming vehicles and taillights of vehicles traveling ahead, then automatically switches between high and low beams to provide better visibility and the road ahead. Each of the four Prius c models offers a little more, with a small hike in base price. Depending on driver’s needs and pocketbook, there is something here for everyone. Gas tank capacity: 9.5 gal.